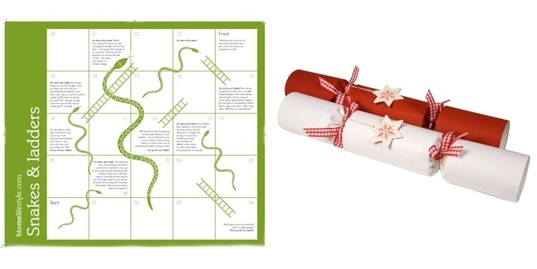 Want to ‘green’ your gift-giving repertoire all the way down to your stocking stuffers? Start with a cheerful, earth-friendly stocking, such as the organic cotton Amenity Holiday Stocking shown above, which is printed by hand with non-toxic, water based, eco-friendly inks. Stuff it with the eco-friendly goodies detailed after the jump, and you’re sure to please your little ones with small delights that will produce big smiles. 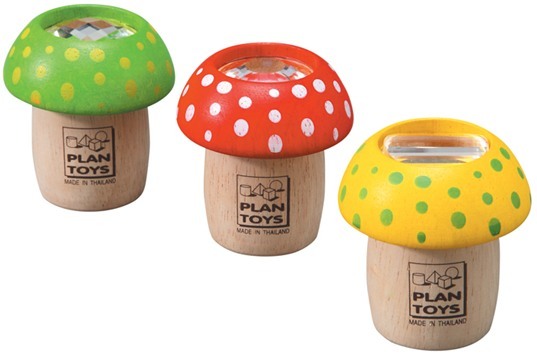 1) Wooden Mushroom Kaleidoscope: Expand your kids’ views with these cool, functional veggies from Plan Toys. They’re made with organic rubberwood, formaldehyde-free glue, non-toxic, water based dyes and finishes. Their packaging is recycled and printed with soy and water based inks. 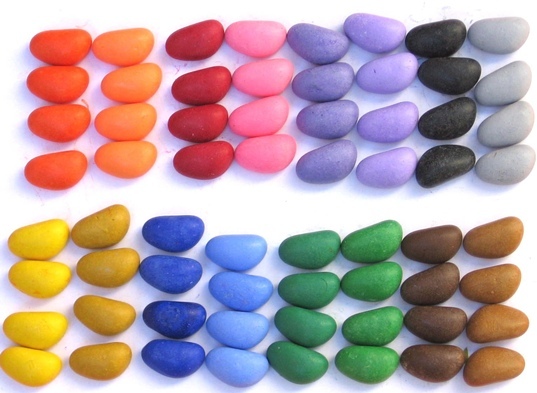 2) Soy Crayon Rocks are non-toxic, bright, and easy for small hands to grasp. Given their soy base, they draw smoothly on paper like pastels; not coarsely like traditional wax crayons. Soy Crayon Rocks are available in a nice little treasure bag pack that comes with 8 primary colored rocks – the perfect small stocking stuffer. 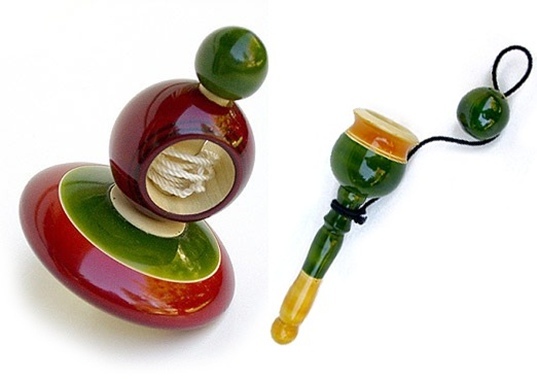 3) Cup & Ball or String Top: Both of these classic toys are handcrafted in wood, and colored with natural vegetable dyes. These make for real old-fashioned holiday fun. 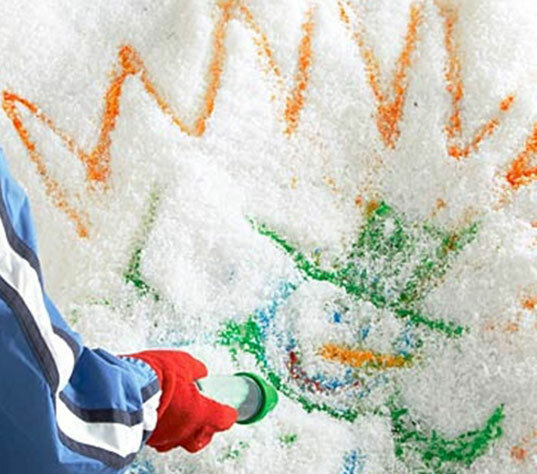 4) Sno-Paint: Tinted sno-paint powder is harmless to kids and the environment… plus, this is a fun way to encourage your kids to get out into nature, even when the weather outside is frightful. The paint dissolves away as the snow melts, so there’s no mess. The one downside of this product, in my opinion, is that the plastic lids on the paints don’t look recyclable. The up side of that, is that you can either purchase refill paint packets, or reuse the paint squeeze bottles for other art activities. 5) Biome Eco Play Crackers: These make a super fun stocking stuffer. You get a box of six recycled holiday crackers (that’s 6 stocking stuffers in one)! Inside each cracker is a different parlor game which encourages family together time during the holidays. On the outside of each cracker is a nice wooden tree decoration. A wonderful, sustainable, and unique idea for Christmas morning. 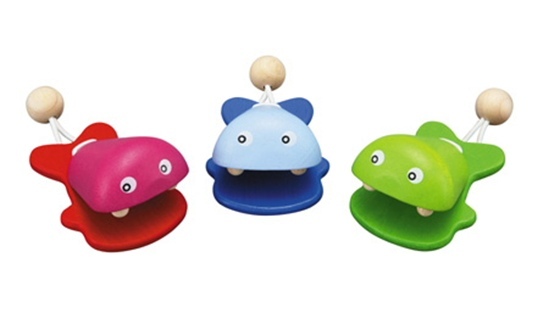 6) Plan Toys Fish Castanet: Like the mushroom kaleidoscopes above, these Plan Toys are also made with organic rubberwood, formaldehyde-free glue, non-toxic, water based dyes and finishes, and come in the same eco-friendly packaging. Kids can help get the festivities started by clacking away on these chomping fish. 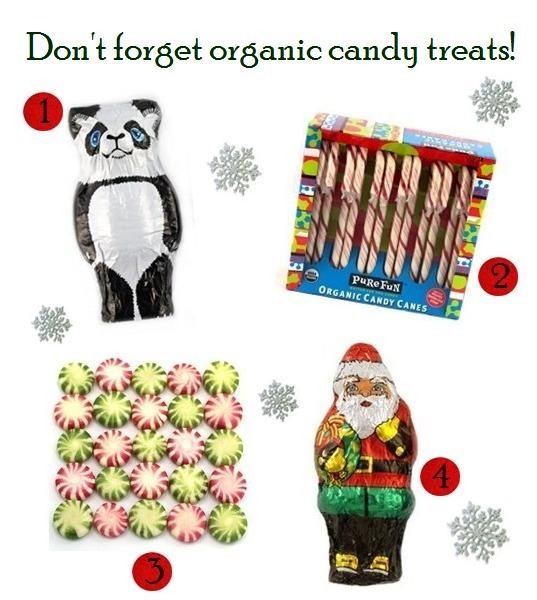 Want to 'green' your gift-giving repertoire all the way down to your stocking stuffers? 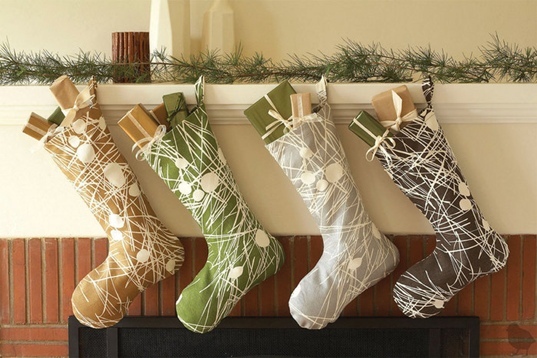 Start with a cheerful, earth-friendly stocking, such as the organic cotton Amenity Holiday Stocking shown above, which is printed by hand with non-toxic, water based, eco-friendly inks. Stuff it with the eco-friendly goodies detailed after the jump, and you're sure to please your little ones with small delights that will produce big smiles.